There’s no shortage of accurate—and readable—information about climate change in the southwestern United States. 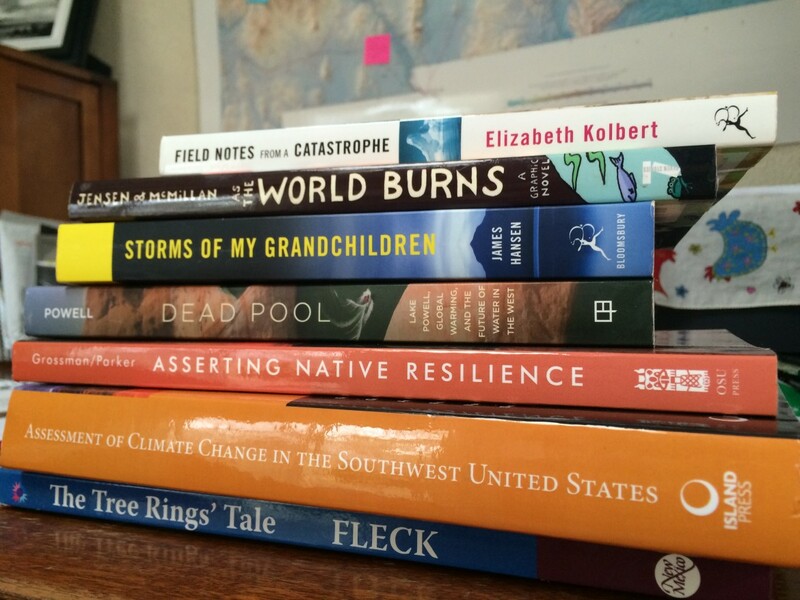 Since we launched this new climate change project at New Mexico In Depth, several people have asked for book recommendations to help them learn more about warming and its impacts here in the southwestern United States. Since I love making lists, I jumped at the chance to share some of the titles on the bookshelf next to my own desk. Bill deBuys has written plenty of great books about New Mexico, including River of Traps: A New Mexico Mountain Life and Enchantment and Exploitation: The Life and Hard Times of a New Mexico Mountain Range. 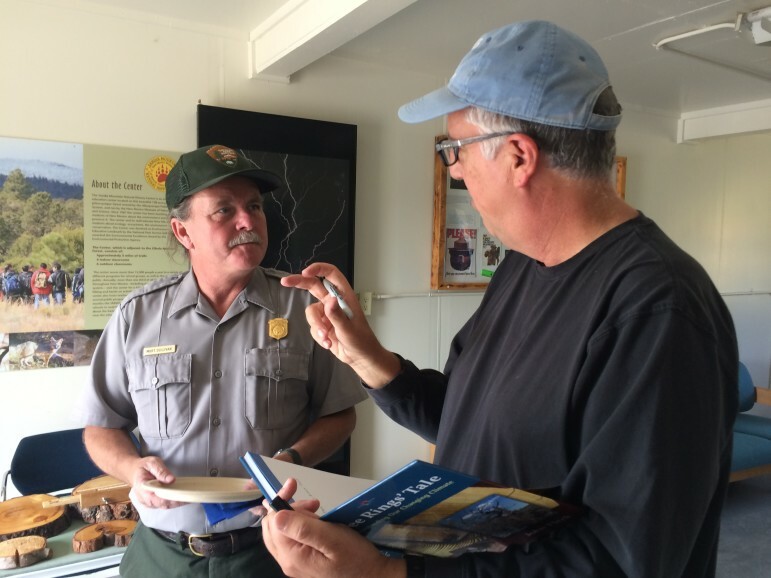 In A Great Aridness, he puts his amazing storytelling skills to work and brings to life the challenges the Southwest is facing as the region warms. The founder and creative director of the nonprofit Quivira Coalition, Courtney White has another new book, Two Percent Solutions for the Planet: 50 Low-Cost, Low-Tech, Nature-Based Practices for Combating Hunger, Drought, and Climate Change. During his long career working on holistic livestock grazing, White has picked up lessons that can be applied to everything from absorbing carbon dioxide in soils to reducing energy use. Journalist John Fleck wrote this book for students, but it’s great for adults, too. You can also read Fleck’s work online at http://www.inkstain.net/fleck/ or search through the Albuquerque Journal archives for the 200+ stories he wrote about climate change during his career at the daily newspaper. As a staff writer, Elizabeth Kolbert writes about climate change for The New Yorker. In Field Notes, she manages to convey the complex science behind things like climate change, Arctic sea ice, and sea level rises with both wit and compassion. She is, without a doubt, one of the nation’s best writers on the issues surrounding climate change. While Native American tribes in the southwestern United States are grappling with things like increased desertification, non-native plant invasions, wildfire, and erosion, tribes along the Arctic and Subarctic are facing sea level rises, the loss of fisheries, and the destruction of entire communities. Although this book is focused on the Pacific Rim, it highlights two crucial issues: Worldwide, Indigenous people are facing some of the most immediate and severe threats from climate change—and many Indigenous elders, scholars and young people are offering up innovative solutions and ideas on how to thrive in the future. In 2010, Sandia National Laboratories released a report demonstrating a risk-assessment methodology for evaluating uncertain future climatic conditions—and took a state-by-state look at what inaction on climate change would do to each state’s economy. The report’s authors looked at the gross domestic product and employment impacts at the state level, interstate population migration, effects on personal income, and consequences for the U.S. trade balance. They found that “the mean or average risk of damage to the U.S. economy from climate change, at the national level, is on the order of $1 trillion over the next 40 years, with losses in employment equivalent to nearly 7 million full-time jobs.” In New Mexico, the risk of damage to the economy—if nothing is done—would result in the loss of $26 billion in gross domestic product and more than 217,000 jobs. Trust me, I know how hard it is to read about climate change. It’s complicated. It’s overwhelming. That’s why sometimes, it’s necessary to set aside the reports and academic tomes—then pick up something that allows us to shake our heads at the ways humans deal with a crisis. And readers! Share your favorite books or authors in the comments section below, please. Looking at more than 400 river basins across the Northern Hemisphere, the authors of a new report find that the Rio Grande and the Colorado River basins are among the most vulnerable when it comes to meeting future water needs.